Temperament: The Jack Russell Terrier is a perky, happy, loving and loyal dog. When properly trained the dog should be spirited yet obedient. Jack Russell Terriers are absolutely fearless dogs. They enjoy playing with toys. Family Dog: Jack Russell Terries are friendly and generally good around children who have been properly taught to behave around a dog. The Jack Russell can be aggressive with other dogs if not well trained and socialized. They do not do well with other small pets in the house. Grooming: The Jack Russell Terrier is easy to groom. They should be brushed or combed regularly with a firm bristle brush. They should only be bathed when necessary. Training: Jack Russell Terriers can be difficult to train. They need strong discipline from a firm trainer. Barking: Jack Russell Terriers like to bark. 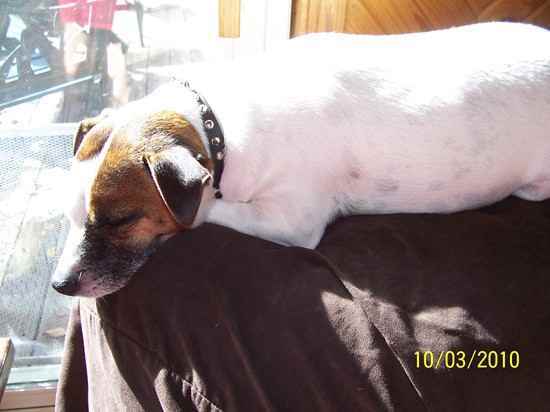 Exercise: Jack Russell Terriers are hunting dogs and love to chase and explore. They require lots of exercise to keep them from becoming restless and possibly destructive. Physical Ability: Jack Russels like to climb, and can climb out of fenced in areas. They are superior jumpers. A Jack that is only 12 inches tall will be able to easily jump five feet. Jack Russell Terriers are recommended for experienced dog owners. Living Conditions: The Jack Russell Terrier needs to have sufficient exercise. There are not recommended for apartment living, but will do okay if they receive sufficient exercise. The Jack Russell Terrier should be crate trained and crated when left home alone. Appearance: The Jack Russell Terrier is a compact, sturdy dog. Size: The Jack Russell Terrier should be between 10-15 inches tall and weigh 14-18 pounds when fully grown. Head: A Jack Russell Terrier's head should be proportionate to its body. The Jack Russell Terrier should have a skull that is flat on the top and of moderate width at the ears. The face should gradually become narrower at the eyes. Eyes: The eyes of a Jack Russell Terrier should be almond in shape and dark in color. They should give the appearance a dog that is intelligent and full of life. Ears: The ears of a Jack Russell Terrier should be small, 'V' shaped and carried forward close to the head. Muzzle: The Jack Russell Terrier should have a muzzle of moderate length. The nose of a Jack Russell Terrier should be black in color. They should have a powerful jaw with strongly muscled cheeks. The Jack Russell Terrier should have strong teeth with a level or scissor bite. Neck: The neck of a Jack Russell Terrier should be long, muscular and gradually widen at the shoulders. Body: The length of a Jack Russell Terrier's body must be proportionate to its height. The chest should be shallow, not spacing the front legs not too far apart thus giving the Jack Russell Terrier an athletic appearance. The back should be strong, straight and, in comparison to the height of the terrier, give a balanced image. The loin should be slightly arched. Forequarters: The forelegs of a Jack Russell Terrier should be strong and straight with correct alignment. The elbows should be perpendicular to the body. Hindquarters: The hindquarters of a Jack Russell Terrier should be strong and muscular. This gives the dog ample drive and propulsion. From the rear, the hocks should be straight. Gait: The gait of a Jack Russell Terrier should appear free and well-coordinated. Feet: The feet of a Jack Russell Terrier are round and wide with hard pads. The feet should turn neither in nor out. Tail: The tail of a Jack Russell Terrier should be set rather high on the body and carried merrily. The tail should be proportionate to the body. Color: Jack Russell Terriers should be mostly white with tan, black, or brown markings. Coat: The coat of a Jack Russell Terrier should be smooth, but not sparse. The coat needs to provide ample protection from the elements. The coat should be rough but not woolly. Life Expectancy: The Jack Russell Terrier should live to be 15 years of age, or more. Characteristics: Jack Russell Terriers enjoy digging and can become destructive if not kept occupied and well exercised. Health: Jack Russell Terriers are prone to Luxating Patella (dislocation of the kneecaps), probably because of all of the jumping. There is some disposition to inherited eye diseases, deafness and Legg Perthes (a disease of the hip joints common in small breeds). History: Developed in England during the nineteenth century by a clergyman name Jack Russell, the Jack Russell Terrier was first breed as a prey catching dog. They were predominately used to hunt small game, particularly fox. © 2019 purebredpups.org - All rights reserved.